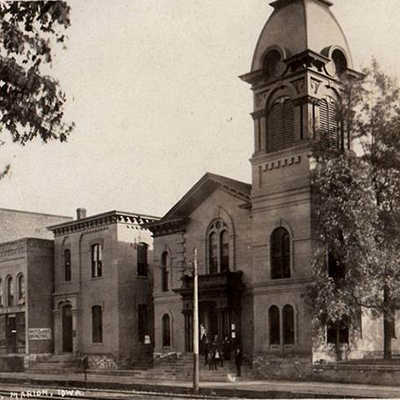 The City of Marion was founded in 1839 as the county seat for the newly established Linn County. By late-19th Century, businesses centered around the City Square Park and Marion had become the business center of the county. 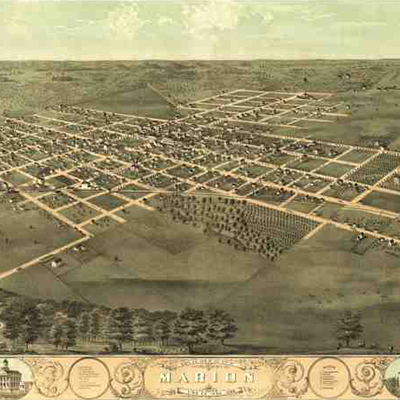 The arrival of the railroad helped Marion continue to grow and prosper. Today, this historic commercial area is known as Uptown Marion, Marion’s designated Main Street District. As the city continues to grow and flourish, our community’s history will be preserved through the missions of Uptown Marion Main Street and the Marion Historical Society, as well as through our partners: Marion Heritage Center and Museum and Granger House Cultural Center and Museum. The Marion Heritage Center and Museum serves as a community center for educational programs, historical displays, art exhibits, and cultural events. The facility, originally built as a Methodist church in 1855, is managed by the Marion Historical Society. 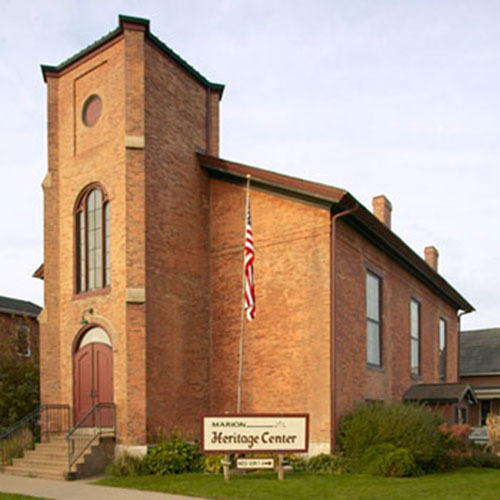 The mission of the Marion Historical Society is to discover, interpret and preserve Marion’s unique history and to provide activities for the community and surrounding area. 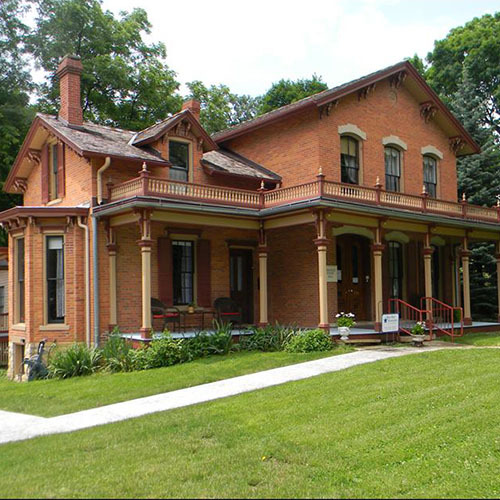 Listed on the National Register of Historic Places and a wonderful example of Victorian Italianate architecture, the Granger House Cultural Center & Museum is the only restored 19th Century middle-class family home in the Cedar Rapids Metro Area. The House provides a one-of-a-kind glimpse into what life was like during the late-1800s. The Granger House Cultural Center & Museum hosts house tours, educational programming, and events throughout the year. The site of the county seat was determined by three newly appointed commissioners, each from a county to the east, the first surveyed town in Linn County. The ‘new town’ was named Marion after General Francis Marion of Revolutionary War fame. The town was surveyed and divided into blocks and lots in November 1839. he first lots were sold at an auction, about where City Park is located today, on 6 December 1839. A frame court building (which stood at the corner of 10th Street and 6th Avenue until 1960) was erected in time for the December Court of 1840. It was obvious to most Americans that the railroad was the opening to “the West.” Settlements would rise or fall depending on their access to a railroad. All communities wanted one. Construction to Marion began in 1858, but it was 1864 before the Dubuque, Southwestern Railway arrived in Marion – a tiny train by today’s standards. A round-trip ticket from Marion to Dubuque cost $300. 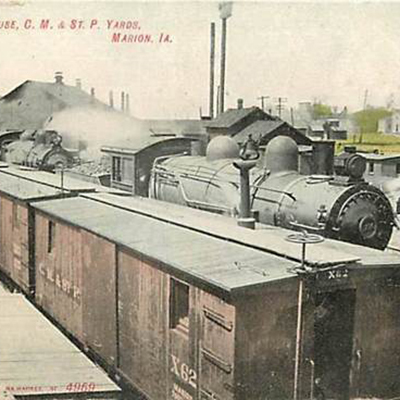 You could leave Marion at 7:35 A.M. and arrive in Dubuque at 1:30 P.M.
Marion business men wanted a larger and more dependable railway through Marion. After serious negotiation and much hard work, the “Milwaukee Railroad” arrived in Marion in December 1827. In June 1887, Marion became a Division Point for the Milwaukee Railroad which meant repair shops including switch tracks, coal yards and the very important repair shops with a Round House. There was a new Depot (the third built in Marion) built on today’s 6th Avenue adjoining 11th Street. Did you know? 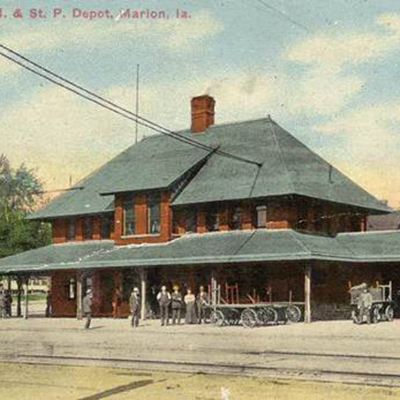 There was concern when the railroad left Marion, for good, in the late 20th century, that the depot was to be torn down. In 1987 citizens acquired the building, moving the roof intact to the south side of City Park in 1988, where it stands today. Many of the bricks were cleaned and reclaimed to form the structure under the roof. Marion looses the vote to retain the Court House as Linn County population growth shifts toward Cedar Rapids. The Lincoln Highway, soon to be paved, will go directly from Mt. Vernon to Cedar Rapids leaving Marion on a by-pass. However, the Milwaukee Road trains still go to the west coast through Marion, stopping at our depot, and rail traffic is high. Troop trains go through town, our men and boys go off to war. After the war, the returning service men and women re-invigorate our business district. Businesses appear that serve the exploding automobile market i.e Western Auto (now Zoey’s Pizza). Bud Dickey began his Dry Cleaning business (a new idea) in part of his Dad’s grocery store (now Lillians), which he grew and operated for more than half a century. Grocery stores began to resemble today’s ‘supermarkets.’ Cira’s (north of the Park) was the first to add ‘grocery carts’ in 1945. Burd Hardware (1958) became Price Electric (1961) expanding to an adjoining store front until retirement in the 1990’s. Marion’s commercial district was busy! This ‘new’ method of marketing hit north Cedar Rapids off Marion Boulevard! Marion Merchants began to feel the pressure and adapted. 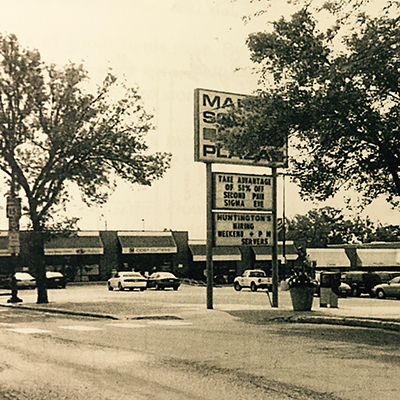 1981 saw the beginning of Marion Square Plaza on the site of dilapidated ‘turn of the last century’ buildings. Marion is adding a new flavor to the Uptown Marion District – arts, culture and dining. 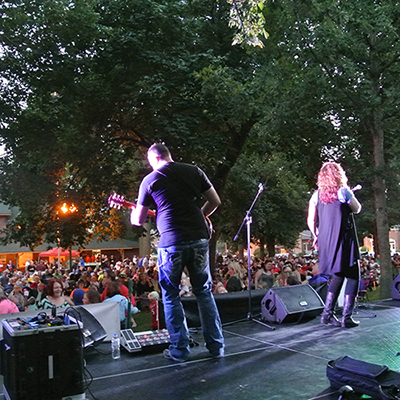 City Square Park is filled in the summer with concerts and farmer’s markets, plus the Marion Art Festival, which is a nationally recognized juried Art Show. Antique shops are busy as are shops that support the arts. One of the first was Campbell Steele Gallery and Liar’s Theater (1991). Recent additions include Alley Gallery (2015) and the popular community theater, Giving Tree Theater (2015). New bars and other eating places are springing up! Keep your eyes open as something new is appearing almost monthly! 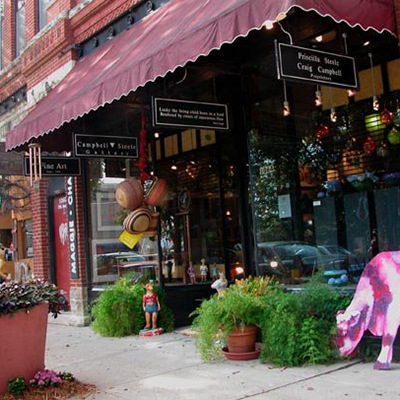 In 2005, Uptown Marion was one of nine communities to be designated by Iowa Department of Cultural Affairs as a Cultural and Entertainment District (CED). A CED is a well-recognized, mixed-use area of a city anchored by a high concentration of cultural attractions. The initiative encourages city and county governments to partner with local nonprofit or for-profit organizations, businesses and individuals to enhance the quality of life for the people of Iowa. Read more. In 2013, Marion was selected as a Main Street Iowa Community, a highly competitive designation granted through Main Street Iowa, a division of Iowa Economic Development Center. 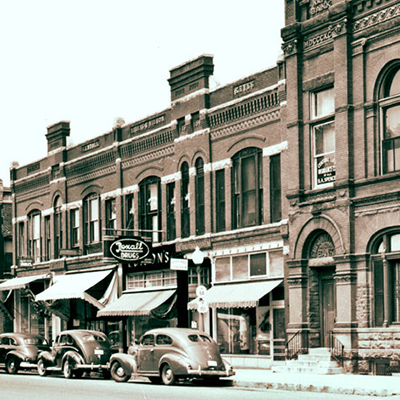 The Main Street Approach® was developed by the National Trust for Historic Preservation’s National Main Street Center with the goal of economic development within the context of historic preservation. 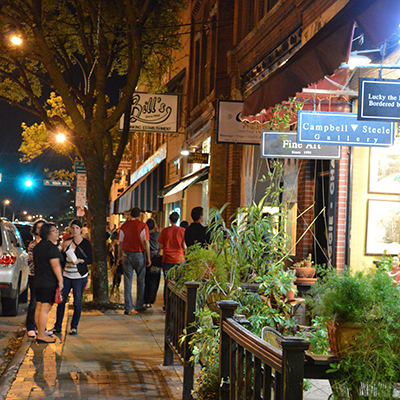 Uptown Marion Main Street’s mission is to drive continued revitalization, growth, and preservation of historic character through appropriate design, promotion, and economic strategies that improve our community.